This page provides background Information on the use of schema.org for marking up automobiles. For more information and communication with the community behind the project, please refer to: http://w3.org/community/gao/. This work has its roots in the GAO project (Generic Automotive Ontology) and existing ontologies such as the Vehicle Sales Ontology (VSO), Car Options Ontology (COO) and Used Cars Ontology (UCO). The automotive extension of schema.org (auto.schema.org) refers to the most important real-world objects related to popular vehicles like cars, buses (coaches) and motorcycles. Whilst the extension allows for a fair description of all kinds of vehicles, it focuses predominantly on passenger automobiles from the retail market perspective. In the selection of types and properties for each of the classes of objects, the extension authors (see "Acknowledgments") were motivated by the principles of simplicity and practicality. 'Simplicity' led to an extremely small set of terms, resulting in a lean extension, whilst 'practicality' limited the scope of terms to reflect the most important objects, as seen from the automotive market perspective. The principle of 'Occam's Razor' dictated the focus on terms, reflecting general consumer preferences observed from the perspective of their searches and typical digital activities related to automobiles. 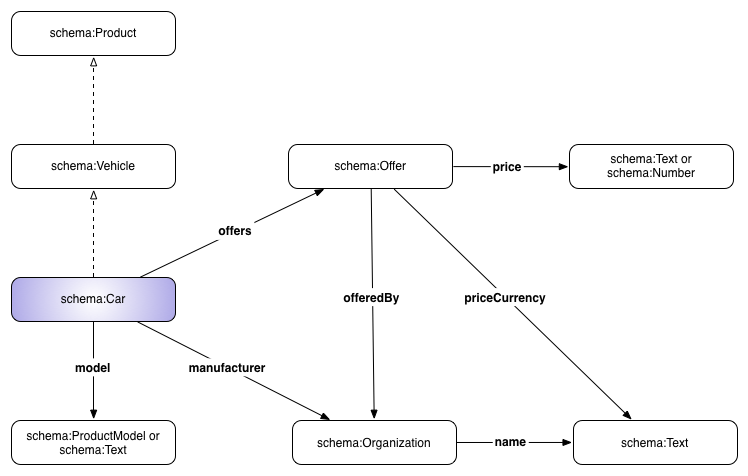 Some of the types and properties that reflect these objects and describe their features, were already defined in schema.org almost from its beginning. Others have entered into life in the "core" vocabulary in May 2015 with the publication of schema.org v2.0, and the totality of the terms was made available in May 2016 with the publication of schema.org v3.0, alongside the creation of http://auto.schema.org. 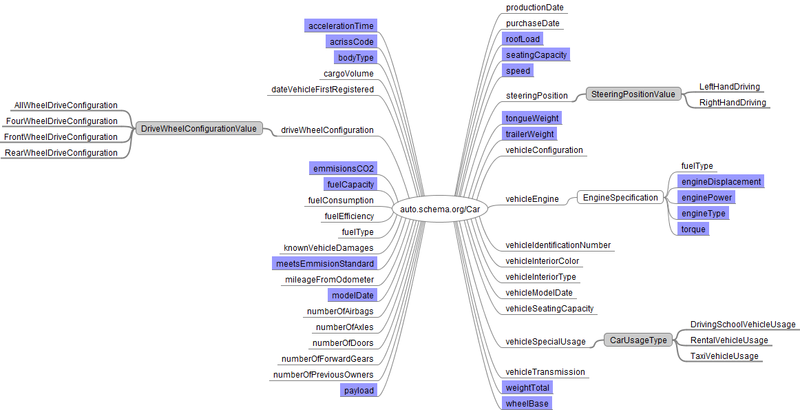 Despite these various origins, in this page we treat them all equally using the umbrella term "automotive extension", as all of them exist in the common shared schema.org namespace. There is no doubt that the extension in its current form cannot satisfy all the needs of the automotive industry. However, what this extension does do is to create a framework that can be utilised now and can bring huge benefits despite its small footprint. The authors of this project are committed to the future development of the automotive 'face' of the schema.org vocabulary. This is particularly important in the years to come as the whole automotive industry is dramatically changing with the proliferation of electric vehicles, popularity of "connected cars" and the advent of autonomous autos. This on-going activity will include both the addition and amendment of the most important types and properties to the schema.org core, to the auto.schema.org extension and also to the future "external" automotive extensions of schema.org that need not be limited by the minimalism of the earlier "lean" approach. The following diagrams represent the conceptual map of the extension. 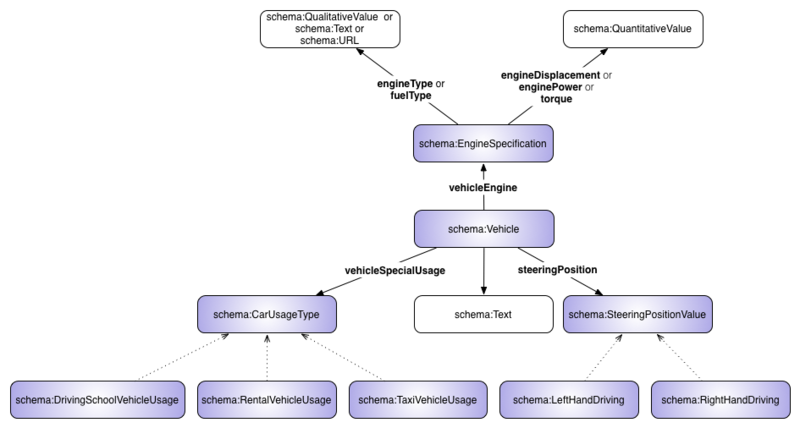 As explained before, the map contains elements from both the schema.org "core" and the actual automotive extension (at http://auto.schema.org). The terms depicted on the violet background are documented in auto.schema.org, the remaining terms are part of the core vocabulary of schema.org. Please note that the map shows the extension properties for the type "Car", which, together with "BusOrCoach", "Motorcycle" and "MotorizedBicycle" is sub-classed from the "Vehicle" type already existing in schema.org. The diagram below illustrates the basic pattern for the description of the main classes of the objects of interest in the extension. The top 'type' for the description of the vehicles, Vehicle, (which is a subtype of Product) is specified by the most important specified types: MotorizedBicycle, Motorcycle, Car and BusOrCoach. The vehicle can be identified by the following schema.org properties: cargoVolume, dateVehicleFirstRegistered, driveWheelConfiguration, fuelConsumption, fuelEfficiency, fuelType, knownVehicleDamages, mileageFromOdometer, numberOfAirbags, numberOfAxles, numberOfDoors, numberOfForwardGears, numberOfPreviousOwners, productionDate, purchaseDate, stffeeringPosition, vehicleConfiguration, vehicleEngine, vehicleIdentificationNumber, vehicleInteriorColor, vehicleInteriorType, vehicleModelDate, vehicleSeatingCapacity, vehicleSpecialUsage and vehicleTransmission. 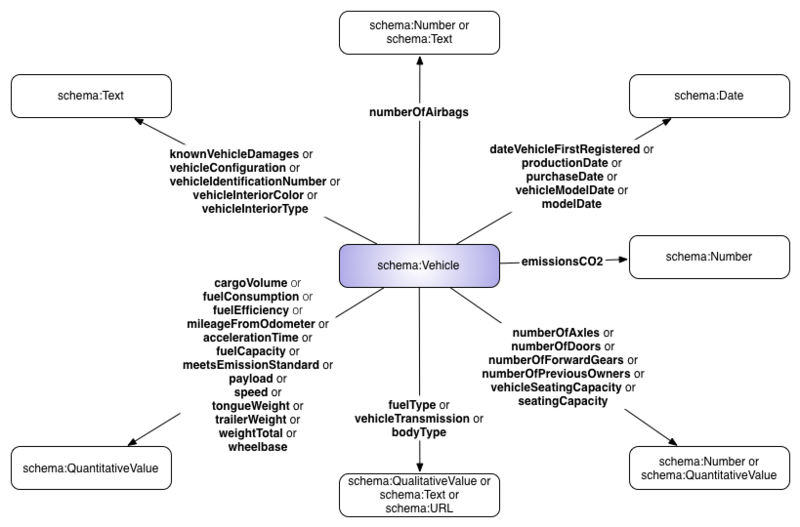 The auto.schema.org extension adds the following properties: accelerationTime, bodyType, emissionsCO2, fuelCapacity, meetsEmissionStandard, modelDate, payload, seatingCapacity, speed, tongueWeight, trailerWeight, weightTotal and wheelbase. Apart from all the properties from Vehicle that the types Car and BusOrCoach inherit, they also possess two extra properties, namely: acrissCode and roofLoad. The driveWheelConfiguration of the Vehicle is described either by Text or through the following members of DriveWheelConfigurationValue: AllWheelDriveConfiguration, FourWheelDriveConfiguration, FrontWheelDriveConfiguration and RearWheelDriveConfiguration. The vehicle's engine can be identified by the vehicleEngine property and EngineSpecification type. EngineSpecification can be then characterized by the following properties: fuelType, engineDisplacement, enginePower, engineType and torque. To indicate whether the vehicle has been used for special purposes, one should use the vehicleSpecialUsage property and the following members of CarUsageType: DrivingSchoolVehicleUsage, RentalVehicleUsage and TaxiVehicleUsage. The vehicle's steeringPosition is descibed by the SteeringPositionValue type and its two members: LeftHandDriving and RightHandDriving. In this example, the type Offer is used to describe Car (a sub-class of Vehicle which is a sub-class of Product) as a product offered to the client. This allows for the expression of the offered price for the car, the currency (priceCurrency) and the Organization offering the product. We would like to thank the following individuals: Martin Hepp, Dominik Kuzinski, Robert Trypuz and Karol Szczepański, coordinated by Mirek Sopek of MakoLab SA for creating the automotive extension and this document. The maintenance and proposals for new elements and discussions are coordinated by the W3C Community for the Generic Automotive Ontology: https://www.w3.org/community/gao/.